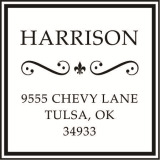 Designer Address Stamp. Pre-Inked with your choice of ink color, Black , Blue, Green, Red, or Purple. Impression size is 1-5/8" X 1-5/8"